The What: Matrox Video has unveiled the X.mio3 12G multi-channel SDI I/O card with on-board video processing, designed to help broadcast equipment manufacturers deploy 4K SDI solutions. 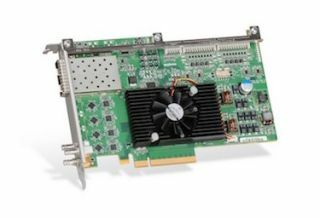 The What Else: Matrox X.mio3 12G is a half-length PCI Express card that offers two 12G SDI inputs, two 12G SDI outputs, and two reconfigurable 3G SDI I/Os allowing for 4K and HD simulcast for broadcast production. Multi-channel hardware processing accelerates computation-intensive operations including up/down/cross scaling and compositing for resolutions up-to-4K. Enhanced by comprehensive Matrox DSX SDKs for Windows or Linux and unlimited Matrox applications engineering support, OEMs can easily bring to market X.mio3 12G based channel-in-a-box systems, video servers, broadcast graphics systems, encoders, transcoders, multiviewers, switchers, and other digital media equipment.